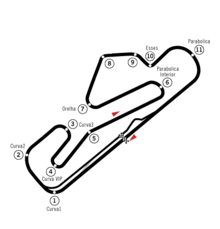 The 1993 Portuguese Grand Prix was a Formula One motor race held at Estoril on 26 September 1993. It was the fourteenth round of the 1993 Formula One season. Michael Schumacher took his only win of the season, the second win of his career, while second place was enough for Alain Prost to clinch the championship, after Ayrton Senna's engine failed. Senna was out-qualified by his new team-mate, future champion Mika Häkkinen, but the Finnish driver crashed out. In a reversal of Hungary, Damon Hill stalled on the dummy grid and started from the back. The BMS Scuderia Italia team withdrew from the championship after this race. On lap 33, Häkkinen crashed into the wall at the last corner. Three laps later, Berger's suspension failed dramatically at the exit of the pitlane, sending him across the start-finish straight, being nearly hit by a Footwork. Blundell crashed from sixth on lap 52 as Prost began to hassle Schumacher. However, second place was enough for Prost to win the championship, so the French driver did not take any risks. Patrese was fifth but he too crashed on lap 64 into the Footwork of Derek Warwick forcing both drivers to retire. Schumacher had a minor off but still just kept his lead. Schumacher won from new World Champion Prost, Hill, Alesi, Wendlinger and Brundle. ^ "1993 Portuguese Grand Prix". formula1.com. Archived from the original on 2 December 2014. Retrieved 23 December 2015. ^ a b "Portugal 1993 - Championship • STATS F1". www.statsf1.com. Retrieved 20 March 2019.